The arrival of the cranes in spring is the sign of spring many people are waiting for, but not always quite certain, as the first crane may appear already at the end of February. 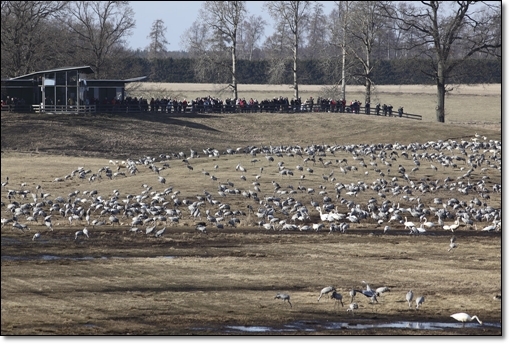 It feels a little nearer spring at the end of March when there might be thousand cranes at Vadboden, a show worth visiting. The crane is our tallest bird, keen on dancing and loud, so it is not difficult to understand that is has become the favourite bird of many people. The big accumulation at Lake Hornborga is of a more recent date, and there are especially two factors that have contributed. First the growing of potatoes for distillation of spirits at the big estates of Dagsnäs and Bjurum, which gave the cranes great opportunities in spring to find waste potatoes in large areas after the autumn crop. Secondly the reduction of the water level of the lake in 1902 and again in the 1930´ies created areas suitable to spend the night in. When distillation of spirits and growing of potatoes ceased, first at Dagsnäs and then at Bjurum after 1971, the possibilities for the cranes to find food decreased, and the number of cranes halved at the end of the 70´ies. Translation to English: Gunvor and Curt Lindholm. at Lake Hornborga where the cranes rest. Cranes are to be found in winter in Extremadura in the Central Western parts of Spain. 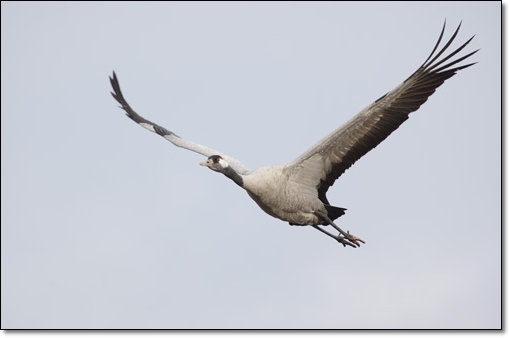 The crane is monogamous (lives life-long with the same partner) and it is ready for breeding at the age of 3. A crane lays 1-2 eggs. At full height a crane is about 120 cm tall, 4-7 kg heavy and may have a wing-span of 250 cm. At the breeding places the food generally consists of frogs, insects, fry and vegetables. The acorn of a certain kind of oak is the most important winter food in Extremadura. Probable maximum age is 25-30 years.